The Olde Salty’s is a local icon that has been serving Carolina Beach vacationers for more than 20 years. 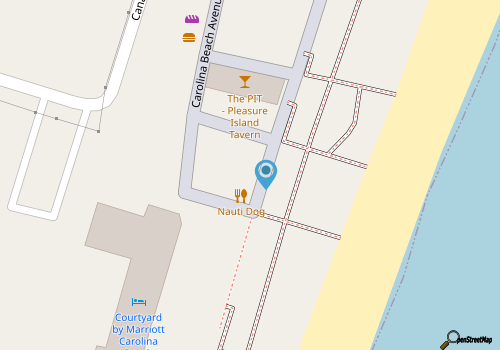 Found within a fairly non-descript building along the Carolina Beach Boardwalk, this classic lunch and dinner spot serves up pirate-approved grub and grog to hungry sightseers and beach-goers alike. While the exterior of Olde Salty’s might be plain, the interior is anything but, thanks to a colorful interior that includes sunny yellow walls, sea-faring murals, a bar with multi-colored stools, and coastal décor – including a stuffed marlin – hanging overhead. Patrons are welcome to saddle up to the bar for an ice cold drink and a light bite, or can settle into one of the adjacent tables to dig into a big meal of seafood, steaks, or even chops. 18 craft beers are on tap, and there’s even an outdoor deck to enjoy the salty breezes, and diners will want to pay close attention to the specials board, which typically features a fresh catch or two. When in doubt, go for the Oyster sandwich or a seafood platter for a coastal bite that fits right in with the beachy setting. Fun and a favorite with locals, Olde Salty’s is a good place to relax, unwind, and dive into a nice shoreside meal. Call (910) 458-8090 for current hours.